This is the third post in a five-part blog series, DLL Data Gaps. Click here to learn more about this project and access the other blogs in the series. 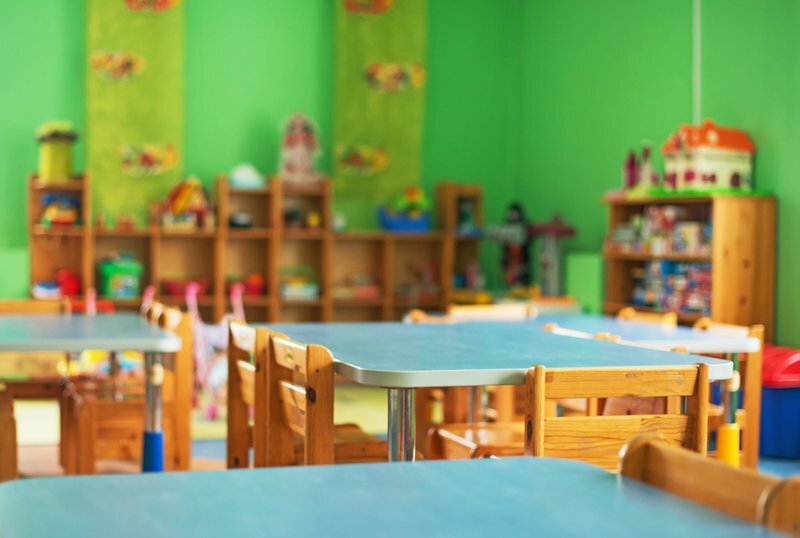 In addition to tracking the enrollment of DLLs in public early care and education (ECE)—as explored in the previous blog of this series—state leaders should also collect data on the quality of ECE programs serving DLLs. Indeed, it is not enough to increase DLL access to ECE generally; DLLs need access to high-quality services in order to reap the full benefits that early learning offers. In recent years, states have turned to quality rating and improvement systems (QRIS) as a data-driven strategy along these lines. First implemented in Oklahoma in 1998, QRIS have spread substantially in the last two decades. From 2012-2016, the federal government incentivized states’ adoption of QRIS through Race to the Top-Early Learning Challenge competitive grants, administered by the U.S. Departments of Education and Health and Human Services. 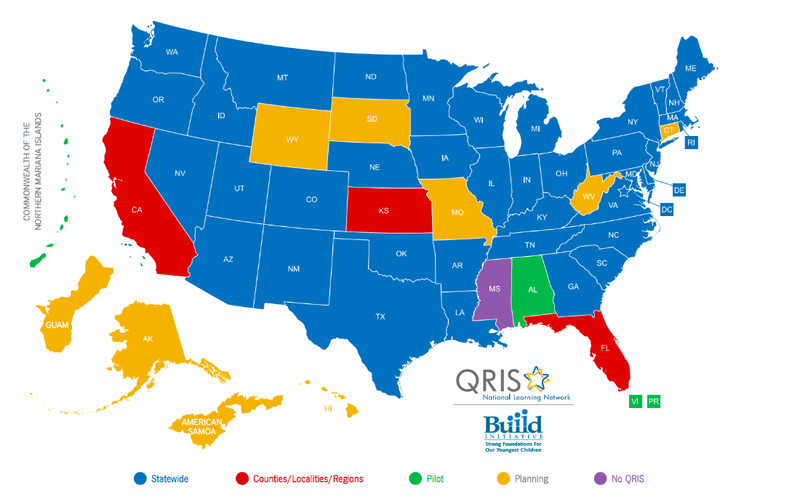 Though some questions linger about their overall validity, nearly every state now has such a system in place or is developing one, with 81,000 participating programs across the U.S. (see the map below from the QRIS National Learning Network). With origins in the child care context, QRIS have evolved over the years into a “state-based framework to define and support high-quality ECE” more globally, according to the BUILD Initiative. QRIS is now a more unified, cross-sector approach; in addition to child care, many states include state pre-Ks and Head Start in these systems. Like rating systems for hotels or restaurants, QRIS evaluates providers on a continuum of multiple indicators (also referred to as standards) across various domains, such as health and safety, learning environment, staff qualifications, family partnership, and more, and then shares those results publicly. In addition to posting ratings online for families and the general public, leaders also use QRIS data to support quality improvement efforts with providers, such as through coaching, professional development opportunities, and other financial incentives. Require bilingual staff proficient in the language of the majority of DLLs in a program. However, not all states are including DLL criteria in their QRIS ratings. In 2017, the National Center on Early Childhood Quality Assurance found that only 40 percent of QRIS currently include any DLL-related indicators. The most frequent example of such an indicator involves providing resources in families’ home languages. And yet, the overall incidence of even this basic standard was low, present in only 5 QRIS, or 12 percent, nationally. The structuring of QRIS ratings can also de-prioritize the significance of DLL indicators even when such indicators are present. Seventeen states use a “building block” approach to award higher ratings; quality indicators must be fully met at one level before a provider can apply to earn the next highest rating level. Some states only offer credit for these DLL indicators at higher levels, such that DLL practices are not a foundational concern in QRIS ratings. Moreover, these DLL indicators often exist (at best) as a few scattered among many others. In some QRIS, a program can receive high ratings even if it fails to earn any DLL-related points. Beyond indicators, there are other challenges to building equitable QRIS for DLLs. In general, getting providers to participate in QRIS presents a major issue. Provider participation levels, which vary considerably and are relatively low in many states, often correspond to the degree that state policies mandate participation for certain providers. 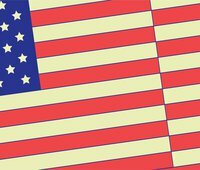 States strive to incentivize participation through various means, but the bureaucratic process remains costly to providers in terms of both time and money. For immigrant and linguistically diverse providers—ones that disproportionately serve DLLs—QRIS participation often comes with extra burdens. For example, these providers may have limited English proficiency themselves and/or lack familiarity with U.S. business procedures and formal jargon. They can also face additional costs for translating materials for submission to state officials for evaluation, such as parent handbooks. To foster equitable QRIS, states must recognize these additional strains and proactively partner with diverse providers serving DLLs, offering additional technical assistance. In addition, since one of the main goals of states’ QRIS is to facilitate parent awareness of ECE quality, states should pay attention to how truly accessible this data is for non-English-speaking families. Most critically, translation of states’ online platforms to communicate QRIS ratings and other documents is severely lacking. According to Char Goodreau, senior technical assistance specialist with the National Center on Early Childhood Quality Assurance, several states rely on Google Translate. Although better than nothing, this approach does not consistently and reliably convert all information. Some states have translated and posted key documents while others have relatively little to no translated materials online. “Translation is not only expensive but there are often limits on which documents can legally be translated,” Goodreau said, referring to copyright issues. Finally, even with translation, the way QRIS ratings are reported do not make it immediately obvious for families which programs will specifically serve DLLs well. State leaders have access to the data on DLL-specific indicators (when they exist) to drive improvement efforts internally, but they typically do not report out this granular data to the public, indicator by indicator. 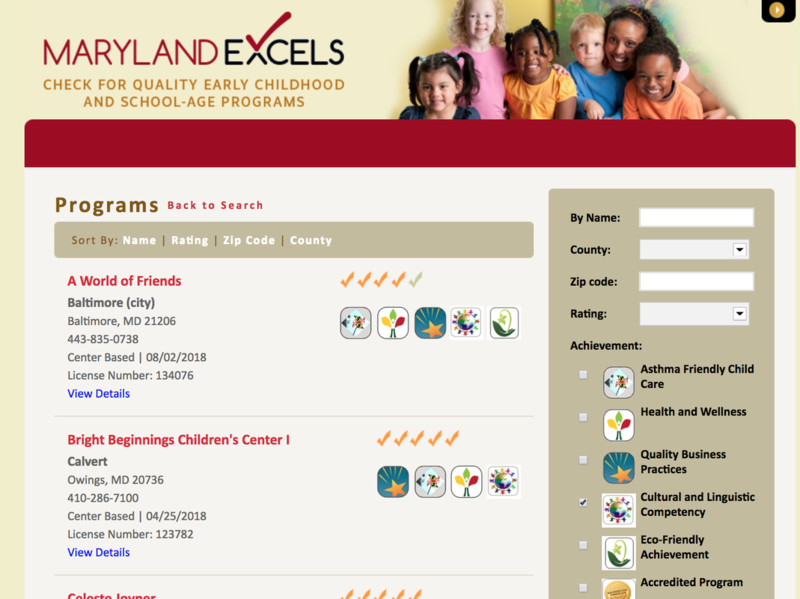 For the DLL population, states should consider bundling the data on all DLL-related indicators and reporting out a DLL “subscore.” Maryland has also created an “additional achievement” badge for cultural and linguistic competency, which providers can apply for and parents use to filter results when using the QRIS online search. Similarly, Illinois has an “Award of Excellence for Linguistic and Culturally Appropriate Practice” that programs can earn as part of their QRIS. These approaches can help convey a clearer, quicker sense of a program’s commitment to serving DLLs. Although, again, if the core QRIS website is not translated, this feature will be unhelpful for many DLL parents. On Maryland's QRIS website, users can search by “Cultural and Linguistic Competency” achievement for DLLs. However, the website is not translated for DLL families. Stay tuned for the fourth blog in this series, which will examine gaps in assessing kindergarten readiness outcomes for DLLs.